Weed VR is the definitive platform for virtual engagement with the cannabis industry. Connecting you with growers and distributors as well as retail partners, Weed VR is a multi-faceted product capable of being packaged for recreational, promotional, educational, and medical use cases. Coming soon to mobile, web, and virtual reality platforms. 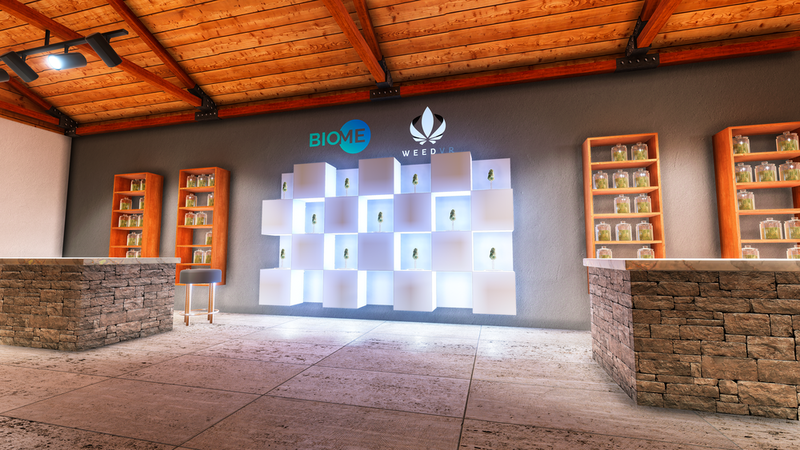 Sign up with your email address to receive news and updates from Weed VR and Biome Grow. What is a VIRTUAL DISPENSARY? Weed VR is a new technology platform that immerses online customers in a beautifully designed retail experience that provides unprecedented access to 24-hour customer care and information. Weed VR focuses exclusively on the medical and recreational cannabis markets. Its purpose is the creation of a multi-platform virtual catalog system designed to educate, engage, and inform purchases. Our digital 3D scanning process will create the world’s first comprehensive strain library that will eventually contain examples of all strains worldwide. Paired with scientific lab data and user reviews, customers will be able to leverage this product knowledge to make educated purchase decisions, without the need to physically go to a traditional dispensary setting. Existing across mobile, tablet, VR and AR, this adaptive platform can be used by anyone. By keeping up with new headsets and mobile devices as they are released, well continue to maintain our position as the first to market leaders in this space.